Kids love the new shadecloth! 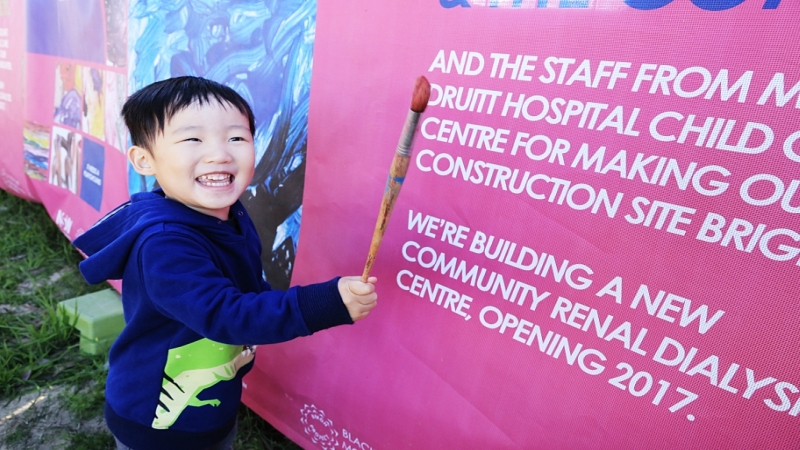 A colourful new construction fence shadecloth has arrived at Mount Druitt Hospital’s childcare centre to brighten up the outdoor play area while construction is underway on the dialysis centre next door. The standard blue construction shadecloth has been replaced with vibrant finger-paintings of things kids think will make a hospital stay happier like rainbows, the beach, animals and stars. Children from the centre used paint, glitter, glue and craft materials to “magic” plain boxes into works of art. The transformed boxes were then photographed by our arts team and the images were transferred to the mesh. “The hospital needs doctors, needles and machines – I’m not scared but my brother is”. And there’s more fun stuff to come – their adjacent playground area will soon get a major makeover, with new equipment that’s safe for little kids as well as the older ones, so all our child care centre stars will be able to make the most of it! Thanks to the wonderful Mount Druitt childcare centre Supernovas and Comets, staff and parents, and Marily and Malcolm from our HARC arts team and our partners Health Infrastructure.